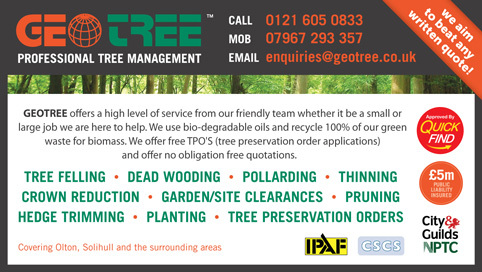 Approved and recommended by Quick Find Directories, Geo Tree are different to many other tree surgery and maintenance companies and place a large emphasis on our environment by recycling all green waste for biomass and customer use as renewable energy. Leaving the smallest carbon foot print possible, their expert team can meet all customer requirements throughout the process and their Arborists provide an outstanding service. A local trusted trader in West Midlands. "Dave and team were on time and did a clean and tidy job. We had a few quotes but I felt more comfortable with Dave and his team to do the job, it was a difficult job removing a tree close to the conservatory." "Pleasant, fast and extremely professional operation, I was really impressed with the work done and the garden was left as described when quoted. More than happy with the price, service and results." "Very well priced, punctual and very tidy. Will definitely recommend A+"
"Had Geo Tree out to sort out my trees, they really know their stuff, very experienced tree surgeons. Good price, no damage, not a bit of debris left behind, highly impressed, will use again!!"